Have you been keeping track of the number of times that you take your car to the auto shop for routine checks and maintenance? The amount of money that you spend is far much higher than that of buying a Pittsburgh floor jack. When you have a good floor jack, you will save on the trips to the mechanics and thousands of dollars for the routine checks. However, if it is your first time to shop for floor jacks for sale, you may end up being confused with all the different brands that are in the market. Even more confusing is when you have resorted to buy a floor jack by Pittsburgh, only to realize that there are different models. 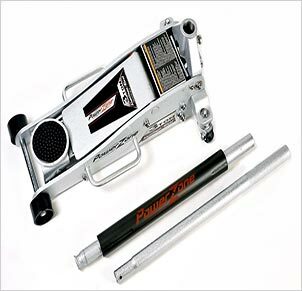 There are several factors to consider and this Pittsburgh Racing Jacks review will also serve as a great guide to help you find the ideal floor jack for your vehicle. We have done a detailed research on all the top models and by following our guidance, you will find the best floor jack for the money. Product Dimensions : 27-1/2" L x 13-1/2"
Product Dimensions : 8-5/8 x 30-5/16 x 13-3/4 in. What’s the best Pittsburgh Floor Jack In 2018? A floor jack is an investment and you would not want to end up with a model that does not serve the purpose. With that in mind, here are some floor jack reviews, which are meant to help you get out of the dilemma of the best floor jack to buy. We have reviewed some of the top models made by Pittsburgh. This Pittsburgh automotive floor jack is well known for its amazing features. The overall construction is solid and it had an industrial grade finish, which makes it appealing. Being a 3 ton floor jack makes it a heavy duty floor jack, which has the capacity to lift vehicles to almost 2 feet off the ground. While using a floor jack, you do not have to worry about it caving in as it is quite sturdy. With a minimum height of 2 7/8th inches, you can easily place it under low profile vehicles and make use of it. With the dual piston rapid pump feature, you will be able to lift your load all the way up, with a mere 3.5 strokes. The maximum lift height of this floor jack is 19 ¾ inches, which would be ideal for most types of vehicles. The length of the handle is 45 ¼ inches, which is long enough and quite convenient. This will allow you to use the floor jack without being forced to overly bending. The overall weight of this jack is 71.7 pounds, which contributes to the stability of the jack, while in use. 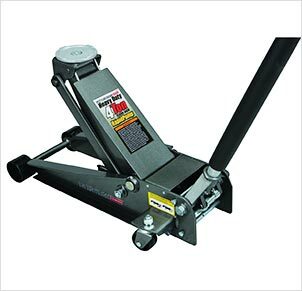 The Pittsburgh 3 ton floor jack has the capacity to lift loads that weigh up to 3 tons, without a problem. With the universal joint release mechanism, you will get accurate load control from any angle of the handle’s position. The two piece handle is knurled up to enhance your grip and has a foam bumper, which protects the vehicle’s components. The extra wide casters on this floor jack will provide you with enhanced stability. 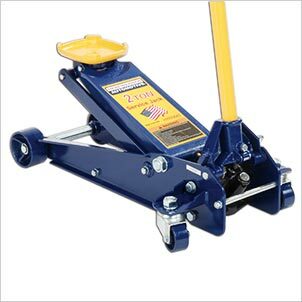 The Pittsburgh 3 ton floor jack is a low profile floor jack, with a minimum height of 2 7/8 inches. The maximum lift height is 19 ¾ inches, which is quite remarkable. You will get a sure grip, thanks to the two piece knurled handle, which is made of steel. In addition, the foam bumper will prevent any marring or scratching of the vehicle’s frame. Due to the industrial construction, which is welded in a precise manner, it is the best floor jack for professional mechanics. The universal joint release mechanism is a feature that ensures precise load control, irrespective of the handle position. The Pittsburgh automotive floor jack has a rapid pump technology, which is facilitated by the dual piston pumps, making it possible to raise your load in just 3 ½ pumps. Imagine being able to lift a load of up to 2 tons, with just 4 pumps. This is what this Pittsburgh 2 ton floor jack is capable of. The aluminum racing jack has a dual parallel pump system which will facilitate the rapid lifting of the loads. In addition to this, the universal joint release mechanism would be effective in precise load control, irrespective of the handle position. When you are done with the floor jack, it requires ½ a turn to lower it back to the resting position. It is constructed from aluminum billet, which is quite sturdy and will not twist or wobble when you are lifting the loads. This is the best floor jack for pit stops, due to the rapid pump mechanisms. The pit crew design is made from aircraft grade aluminum and has a sapphire anodized finish. This is quite appealing, but also makes it ideal for the industrial tasks and can be used by professional mechanics. As for the handle, it is made of aluminum and knurled up to give you a secure grip when using this floor jack. It also comes with a foam bumper that will prevent any damage in the event that the handle comes into contact with the vehicle’s frame. There is also a saddle that has a rubber pad, which not only protects the vehicle but also enhances the contact with the load. As such, there will be no cases of slippage when the floor jack is in use. 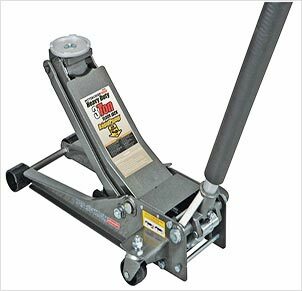 The Pittsburgh 2 ton floor jack has the capacity to lift and support loads of up to 2 tons, comfortably. The Rapid Pump is an exclusive feature for the Pittsburgh floor jack and will allow you to lift the vehicle in about 4 pumps. This is as a result of the dual parallel pump system. The universal joint release mechanisms will facilitate precise control of the load, from any position of the handle. The rubber saddle is well padded to enhance the contact and also prevent any cases of damaging the frame of the vehicle. The two piece knurled aluminum handle will give you a secure grip when pumping the floor jack. In addition, it is fitted with a foam bumper, which will protect the vehicles from any denting. 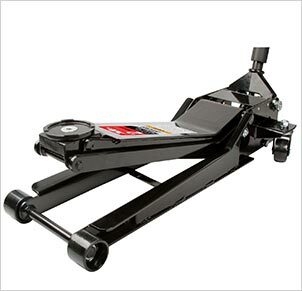 The rapid pump feature is one of the best things that this Pittsburgh 3 ton floor jack has to offer. As such, you will be able to get to the maximum height with merely 3 ½ pumps. In addition to this, once you are done using the pump, you will only need ½ a turn release to lower the floor jack to the resting position. As far as durability and longevity go, this floor jack comes with all welded steel construction, which makes it durable and strong enough to handle any form of lifting task. Drawing from its name, you will realize that it has the capacity to lift up to 3 tons of load. As far as precision in load control goes, that is catered for by the universal joint release mechanism. With an ideal weight of 68.9 pounds this floor jack will be steady and firm while in use. The extra wide casters also play a vital role in ensuring that the floor jack is stable enough to handle the maximum load, without wobbling. The lifting range of this model is 5 inches, all the way up to 18 ¼ inches. It has a two piece aluminum handle, which is knurled up to ensure that you have a firm grip. It is also loaded with a foam bumper, which will protect the vehicle from any form of damage. The dual piston pump is responsible for ensuring that the floor jack gets to the maximum height pretty fast. 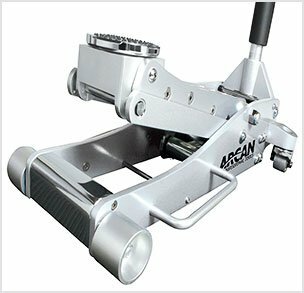 These are some of the reasons why it is ranked as the best floor jack for the money. 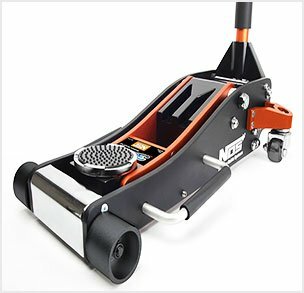 Pittsburgh Heavy Duty steel will highlight the solid construction of this floor jack and the industrial grade finish, which makes it ideal for professional mechanics. The universal joint release feature guarantees you excellent load control in any position of the handle. The Pittsburgh 3 ton floor jack has a rapid pump, which is made exclusive by the dual parallel pump pistons. You vehicle finish will be protected by the foam bumper on the handle and you will also have a secure grip as the aluminum handle is knurled. 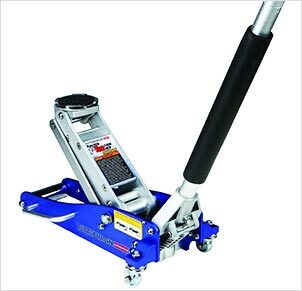 If you have big vehicles that have a whole lot of weight, then you would need a floor jack with a higher lift capacity. 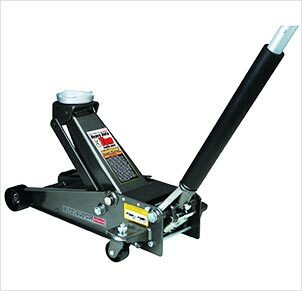 This 4 ton Pittsburgh car jack has the capability of lifting loads of up to 4 tons and will go as high 20 ½ inches. With this variable lifting range, you can easily use it to lift your motorbike or vehicle easily. There is a rapid lift technology, which will allow you to get the vehicle to the maximum lift point with only 3 ½ strokes on the pump handle. Unlike other types of jacks that may cause some damage during use, this particular model of the Pittsburgh floor jack has a foam bumper, which will protect the frame of the vehicle, from any form of damage. The aluminum handle is knurled and this will give you a firm grip when using this floor jack. The welded construction made of steel makes the floor jack solid and you can use it for heavy duty tasks. The minimum lift height is 4 inches and since this floor jack weight about 100 pounds, you will be confident of its rigidity when it is lifting the vehicle off the ground. As far as the precision in load control goes, the universal joint release mechanism will provide for this, effectively. As such, irrespective of the position of the handle, you will be fully in control of the load. It comes with front wheels and extra wide swivel casters, which will make it easier to maneuver and position the floor jack. 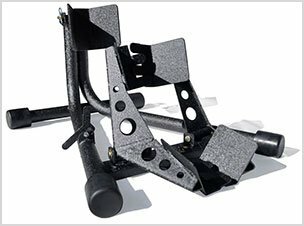 The construction of the Pittsburgh car jack is solid and steel welded and comes with an industrial quality finish, which makes it durable and appealing. This floor jack has a lift range of 4 inches to 20 ½ inches, which makes it ideal to lift different types of load, thanks to the variable lift range. You will be able to lift loads of up to 4 tons using this floor jack without much difficulty and with minimal effort. Some of the critical features include the universal joint release system, which will facilitate precise load control. Being made of heavy duty steel, it is quite stable and the extra wide steel casters also enhance the stability of this floor jack. For those who need a Pittsburgh racing 1.5 ton floor jack, this is the right model. Being made of aluminum, it is quite durable and would be a worthwhile investment. It is welded using aircraft aluminum billet, which extends its longevity. The knurled steel handle will give you a steady grip when lifting when using the floor jack to lift your load. With the amazing quick lift system, you will be able to lift your load to the maximum height, with just 3.5 pumps. This is made possible by the dual pistons that support the hydraulic pump in such a great manner. As for the load’s control, the universal joint release is the mechanism responsible for such and this will provide a smooth flow when raising and lowering the floor jack. The compact design of this model makes it easy to carry and also store conveniently. The pit crew design is made of aircraft aluminum and the industrial finish is made possible by the sapphire anodize. 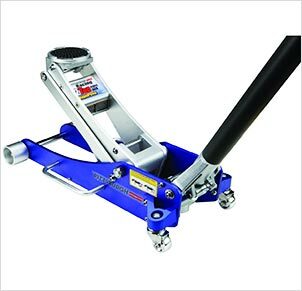 This is an effective floor jack for professional mechanics as well as the avid enthusiasts of automotive. The handle is also fitted with foam bumper, which will prevent the floor jack from damaging the vehicle and other components. As for the saddle, it is cushioned with a rubber pad and with this, you can be sure that the contact with the load will be secure and will hardly slip. It has the capacity to lift loads of up to 1.5 tons, with the lifting range being 3 3/8 inches to 14 ¾ inches. It weighs 26.8 pounds, which makes it portable and easy to move it around. The pit crew design quality of the Pittsburgh Racing 1.5 ton floor jack is machined from aircraft grade aluminum and given a sapphire anodized finish. Lightweight Floor Jack With the exclusive dual parallel pump system, you will be able to lift the load up to the desired height with only 3 ½ pumps. The lifting range is 3 3/8 to 14 ¾ inches. The two piece knurled steel handle, you will have a firm grip while using this floor jack and it is also fitted with a foam bumper to prevent any damage to the vehicle. The universal joint release mechanism will provide precise load control, for loads of up to 1.5 tons. The saddle has a rubber pad, which will prevent any cases of marring or scratching. Every vehicle jack has a specified lift rating, which you should consider. This will be determined by the average weight of the vehicle, but also bear in mind that you will only be lifting one side of the vehicle at ago. Aluminum floor jacks are said to be quite durable and strong. You should refrain from the floor jacks that have a number of plastic parts, as they do not seem to last for a very long time. You should go for the jacks made of heavy duty steel and aluminum. The minimum height is one of the key issues highlighted in floor jack reviews. The main issue here is the ground clearance of your vehicle. If it is too low, you should go for the low profile jacks, so that you can get proper service. Take note of the maximum height that your floor jack can reach. This will allow you determine the space availed to be able to access the components that are underneath the floor jack. Every inch in a floor jack will make a huge difference when it comes to the lifting range. As you may have seemed most of the Pittsburgh floor jacks have a rapid pump, which is exclusive to this brand. When shopping for a floor jack, find one that allows you to get to the desired height with fewer strokes on the pump. How to Use a Automotive Jack? The first step is being able to get the best floor jack for the money and then the next step is the proper use. When you do not use your floor jack properly, you may never realize its true worth. Here is a simple guide, which allows you to use the floor jack in the right manner. One of the safety precautions when using a floor jack is to ensure that you are jacking the vehicle on a leveled terrain. 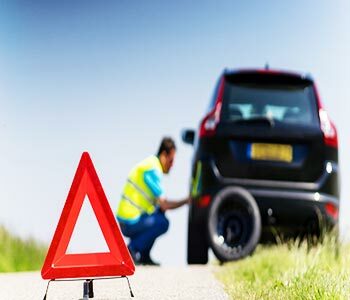 You should never make the mistake of trying to lift the car on a slope or any place that is slanted. Also, ensure that the ground is stable enough to support the jack and the load. Do not go underneath the vehicle before placing jack stands on the specific points that you want to be raised. A floor jack is a mechanical device, which is prone to failure. As such, you should not fully rely on your auto jack, without using the jack stands for additional support. Take note of the jack points that are marked on the vehicle and place the floor jack at the respective places. The saddle should be in contact with the specified jack points. If the car is not well marked, you can use the internet or your owner’s manual to identify the jack points on the vehicle. Finally, when raising and lowering the floor jack, use slow motions and keep your eyes on the floor jack. This is meant to help you monitor the performance of the floor jack. Check if there are any oil leaks or any parts that seem to be cracked and caving in. When you notice any defect, you should stop using the jack and find solutions to fix it. 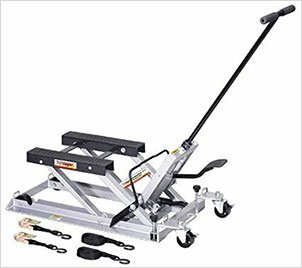 Any professional mechanic will tell you that having a Pittsburgh floor jack is a great choice and you will get all the service that you need. In our reviews, our recommendation is the 4 Ton Heavy Duty Floor Jack Steel Rapid Pump Lift Car Vehicle Garage Shop Repair. It has a variable lifting range as well as a high lift capacity. If you found this article interesting, feel free to share it with your friends, who may need the information to be able to buy the best floor jack for the money. I have the Pittsburg Automotive Racing 1.5 ton rapid pump jack and have been very pleased with it. on the pump anywhere. Need some help (advise) on how to repair.